If you know me, you know I am obsessed with salted caramel. I make several batches of caramels every year, usually to give alongside treats like my peppermint sugar cookies. Out of pure curiosity last night, I decided to tweak the base for my basic sugar cookie recipe and use the caramel in it instead of peppermint. After they baked & cooled I made a caramel icing glaze, drizzled them with melted caramel & topped them with sea salt. The result was gooey, chewy & bursting with layers of rich vanilla-caramel flavor topped off with a well-balanced salty-sweet crunch. I am in looooooove. Here’s how I did it. Let me know if you try the recipe – I welcome feedback! Cream together butter and sugar for a few minutes until light and fluffy. Add egg, extract and salt and mix until combined. A cup at a time, add the flour until just combined – do not overmix. Roll the dough into ½” balls and divide each caramel square into 4 pieces – you are going to stuff each dough ball with one of these caramel bits. To assemble, lightly flatten 2 dough balls, place a caramel bit between the two and press edges together around the caramel. You may need to roll the newly formed ball a bit more between your hands to completely seal the caramel inside the cookie. Place each ball on the lined cookie sheets, a couple of inches apart. Bake cookies for 10 minutes (I tend to put the pans in for 5 minutes, rotate/turn them and cook for another 5 to ensure even cooking). They’ll still be light – browned edges mean they’re overcooked. You may have a little caramel leakage, but that’s okay. In a small bowl, whisk sugar, water & extract together. Once royal icing reaches a thick but spreadable consistency, add a tablespoon or two of the melted caramel and stir until well combined. Dip tops of cookies in icing or brush on tops of cookies with a pastry or basting brush, then drizzle remaining caramel over cookies and sprinkle with a bit of sea salt. Let the topping harden completely before serving or packaging. This entry was posted in Sweets and Treats and tagged caramel cookies, salted caramel, sea salt caramel, sugar cookies on December 19, 2016 by Dara O'Bannon. Happy National Running Day from INKnBURN! This entry was posted in Running and tagged INB, INKnBURN, inknburn ambassador, national running day, Running on June 1, 2016 by Dara O'Bannon. I was a little tired of ground turkey last week and boneless, skinless chicken breasts were on sale, so I whipped up this mushroom spinach chicken for half of my meals. Like my other meal prep “recipes” (wherein I throw a bunch of clean ingredients together and call it a meal), it took less than 20 minutes to prepare. This batch made 3 servings (I had a six pack of breasts and used the other half for another recipe that I’ll be adding soon) but there would easily be enough sauce and veggies for 4. Place chicken breasts between sheets of waxed paper or plastic wrap and pound to 1/2″ thickness with a mallet or the smooth surface of a meat tenderizer. Remove wrap and season chicken with salt and pepper. Heat oil over medium heat in a large skillet. Cook 3-4 minutes on each side until done, then remove from skillet and place on a serving platter. Add garlic, mushrooms and 1/2 cup of the broth to skillet and stir while bringing to a boil. Cook until most of the liquid evaporates. Sprinkle flour or arrowroot powder over mushrooms and stir for 30 seconds, then add the remaining broth and the lemon juice ** and bring back a boil, stirring constantly until slightly thickened. *** Turn heat down to low and add spinach leaves, stirring them in until they are lightly wilted. Slice each chicken breast and portion out into your meal prep containers, then ladle equal amounts of sauce into each container. ** If you don’t have lemon juice, use lemon pepper to season the chicken and add another pinch or two at this point. *** If you want a creamier sauce, you can add a tablespoon or two of milk (or almond milk) too at this point – but mine was plenty creamy without the addition. Nutrition per serving: 263 calories, 7 grams of fat, 8.3 grams of carbs, 39.6 grams of protein, 1.8 grams of fiber. This entry was posted in Nutrition and recipes and tagged chicken, chicken breasts, clean eating, high protein low fat, meal prep, mushroom, spinach on May 23, 2016 by Dara O'Bannon. I’ve been back on my meal prepping kick lately – I’m working on building more muscle and leaning out a bit, so it’s nice to have a fridge full of healthy options to fuel my workouts. I’ve been asked to blog some of my recipes, so I thought this would be a nice one to share – it’s vegan, gluten-free and packed with fiber. The flavors came together so well that you’d never guess that I came up with this on the fly and later had to backtrack to list the ingredients after throwing them together! My original plan was to make dahl with some red lentils I picked up at Sprouts this morning, but then I noticed the kabocha squash still sitting on my counter from last week. I’m a huge fan of kabocha squash – it’s so tender and creamy and its sweetness works beautifully in curry. I grabbed a can of chickpeas from the pantry and a bunch of kale from the fridge and bam! Curry with very little time or effort. This made six 1-cup servings, one of which was promptly eaten as I packed away the rest. Simmer squash in broth over medium heat in a covered nonstick skillet until tender (took about 10 minutes, so lentils and squash were done around the same time). ** Add lentils and chickpeas and simmer for a few more minutes, then add the kale and simmer until barely wilted. Season with curry powder (I like mochi curry powder best with kabocha but any variety will do), simmer for another 2-3 minutes and serve. ** Note: for a creamier sauce, you can hit the squash with a stick blender or mash part of it with a fork to break it down a bit more, but as it simmers it’ll soften enough to add creaminess without this being a vital step. According to MyFitnessPal, each 1-cup serving contains 254 calories, 2.3 grams of fat, 44.9 grams of carbs, 15.1 grams of protein and 14.4 grams of fiber. This entry was posted in Nutrition and recipes and tagged chickpeas, curry, garbanzo beans, gluten-free, Kabocha, kale, meal prep, red lentils, vegan on May 23, 2016 by Dara O'Bannon. Yesterday I ran the Honor Connor 5K for the 2nd time. I was comparing my 2015 & 2016 performances this morning and had a major epiphany re: my running (and my coaching in general). In 2015, I coached a Run for God 5K Challenge class at my church; Honor Connor was our goal 5K. My only personal goal for the race was to finish quickly enough to go back out on the course and run in with each of my classmates, which I got to do (with the exception of speedy Phil, who finished a few minutes before me and was probably the most joyful runner on the course). A couple of my runners won AG awards, which made me so incredibly proud. It was a wonderful experience and I enjoyed every minute – I didn’t PR and I didn’t AG place but I didn’t care, because it wasn’t about me. Due to scheduling conflicts (Girls on the Run, my Big Sur marathon training), I was unable to coach a spring R4G class this year. I ended up running Honor Connor alone as a baseline run for the Sub-30 Club #getyourPR project, which is an 8 week initiative to set and crush time goals in the 1mi, 5K, 5mi or 10K distances. I tried to run by feel rather than aiming to hit a particular pace, but I still found myself obsessing over time as I ran. I was 3 seconds faster than last year’s run on the same course, but I was 5:21 off my 5K PR. Nothing was necessarily “wrong” with my run, other than me feeling slow and vaguely unhappy. There was no joy or pride in my performance. Finally to the point of this post: it hit me this morning that I enjoy running so much more when I am helping someone else reach their goals. Probably 75-80% of the races I run are at someone else’s pace, whether I am running with my best running friend, cheering on my GOTR girls or R4G folks, meeting a new friend on a course and helping them finish or pacing a group. When it’s my turn to aim for a pace above my current personal ability, that’s when the wheels fall off of the most important part of running: the sheer joy of it. And if I think about it, this applies to my coaching in derby and in personal training as well. I’d rather help someone else achieve their goals than try to reach my own. I’ve long said I’m a better coach than I am an athlete, and yet I need to have a certain level of fitness as an athlete to keep up with the skaters and runners that I coach. So what’s the solution? 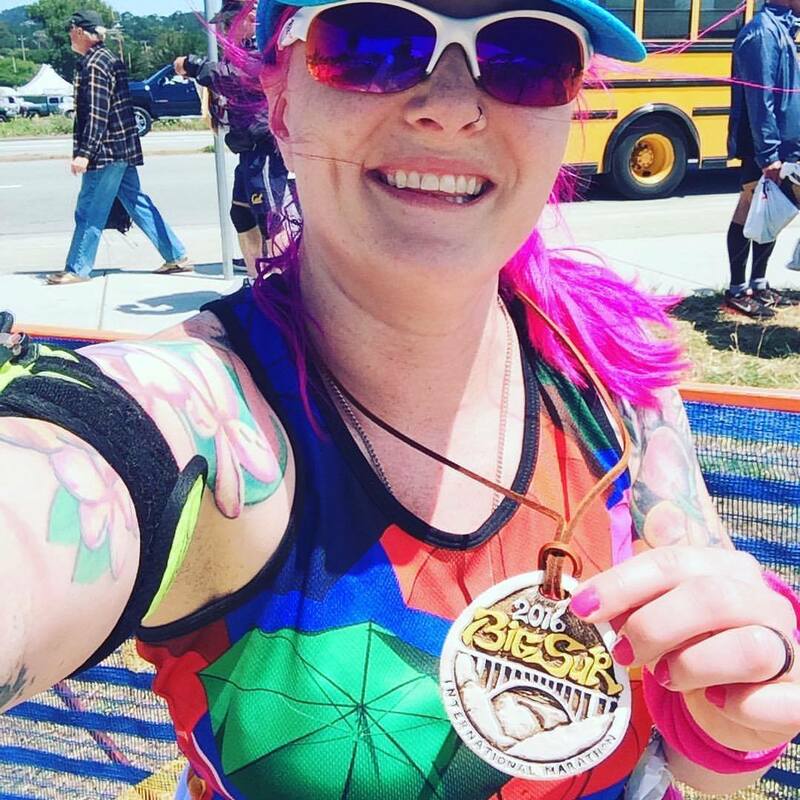 Do I find a running coach/pacer for myself so that I have someone who will be proud of me (which is very motivating for me as a people-pleaser), since I clearly have a hard time being proud of myself? Do I scrap the idea of aiming for a PR for awhile in order to preserve/regain the joy of running, even if that means not working toward pacing faster groups because I have limited myself? Maybe I’m still burnt out and recovering from Big Sur Marathon. I feel like this running ennui is the state I’ve been in since Dallas Marathon in 2014, though – I went from that injury-tainted 26.2 debut to the letdown of Cowtown Marathon 2015 (canceled due to an ice storm so I ran it on a treadmill) to the highs and lows of checking my #1 bucket list race off my list a month ago, with a subgoal in 2015 of running 12 half marathons in 12 months (I ended up running 13 + the treadmill marathon). Perhaps the solution would be to just stop running for awhile and concentrate on strength-training and kickboxing, but I don’t know if that would help or hurt me since I have self-identified as a runner since I was 7 years old. I just want to find my way back to that mindset I had when I was 7, when the sheer joy of running across a field full of cows and sunflowers was the only thing that mattered. That’s enough self-absorbed navel-gazing for one day. I’d rather be writing meal plans and workout programs for other people. This entry was posted in Running and tagged coaching, getyourpr, honor connor, pacing, PR, R4G, run for god, Running, sub-30, sub30 on May 22, 2016 by Dara O'Bannon. Instead of sleeping, I am obsessing over choosing my next marathon. The funny thing about checking off the #1 item on your bucket list – the dream that motivated you to want to run again when you couldn’t even walk, the thing that represented rebirth after a piece of you died – is that once it’s been checked off, there’s a big empty spot on the list. I assumed the other items (Black Mountain, NYC, MCM, London, etc) would each shift up a slot. And I’m sure they eventually will. But I find myself keeping #1 open as I try to decide what would fulfill the requirements of fulfilling me. And having just run one of the most beautiful & toughest road races in America, it’s a tall order to fill. My current choices are all fall/winter races & all within driving distance. Two represent redemption & are repeats: Dallas in December, which I limped through with herniated discs & severe sciatica against my chiropractor’s advice in 2014 & Cowtown in February, which I ran virtually on a treadmill when ice storms caused the organizers to cancel the marathon in 2015. Both left me conflicted & unsatisfied for very different reasons. Both are relatively flat/fast & neither conflict with anything else on my schedule. The third option is as close to a Big Sur experience as I can get in my home state: a very small race with incredibly challenging elevation, little to no spectators & breathtaking views (it is marketed as “the most beautiful marathon in Texas”). It’s in November, which means I’d be training for hills in the extreme heat of summer. It falls on the weekend between the 5K I help organize and the 5K I direct & it’s right in the middle of my coaching schedule for my fall church running group & for Girls on the Run. 3 guesses as to which one I’m leaning toward. Guess I just like a good challenge. 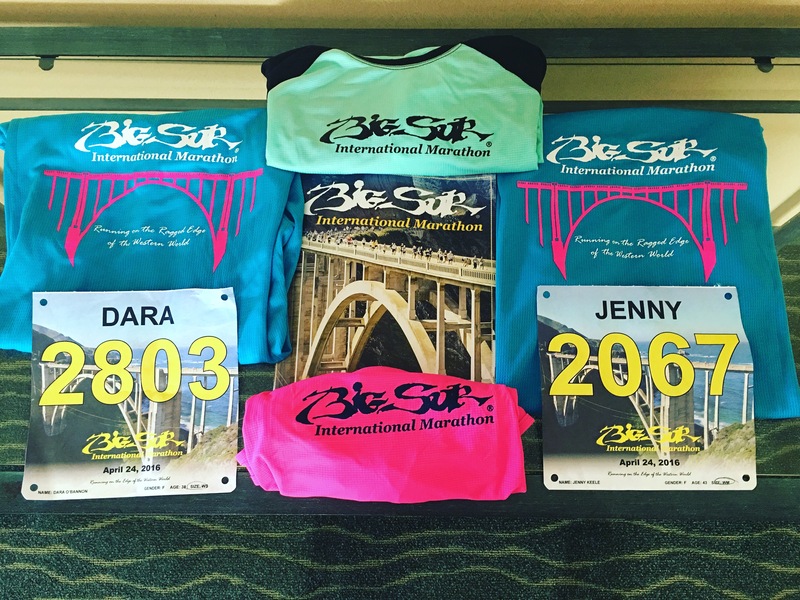 This entry was posted in Running and tagged big sur marathon, bucket list marathons, cowtown, dallas marathon, hill country marathon, marathon, race bucket list, running after orif on May 16, 2016 by Dara O'Bannon. I’m terrible at timely race reports, mostly because I go through a multi-stage process every time I run a race. * Stage 1: Finish Line – Elation. Over-the-top, I-love-everybody-and-everything style joy. I want to dance and sing and kiss strangers. I am the greatest. * Stage 2: A Few Hours Later – Critical Analysis. I review my performance and nitpick how I could have done it better. I could have been so much greater. * Stage 3: A Couple of Days Later – Endorphin Crash. With dopamine levels completely depleted, I am convinced I am the slowest runner ever and that I had no business running a marathon. I am the worst. * Stage 4: When Race Pictures Are Released: Self-loathing. I swear I was running and not slowly walking like every photo seems to depict. Also, do I really look that heavy in person? At least I’m smiling…I mean, I look vaguely maniacal, but it’s a smile. Is there something worse than worst? If so, I’m that. * Stage 5: Acceptance – Generally a few weeks post-marathon, when I can look back and laugh. (I also call this my Apathy Tipping Point, wherein I have cared so much that I finally stop caring entirely.) I’m cool. So yeah. That’s why I’m typing a race report tonight for a marathon I ran 3 weeks ago. It’ll be long. Settle in. 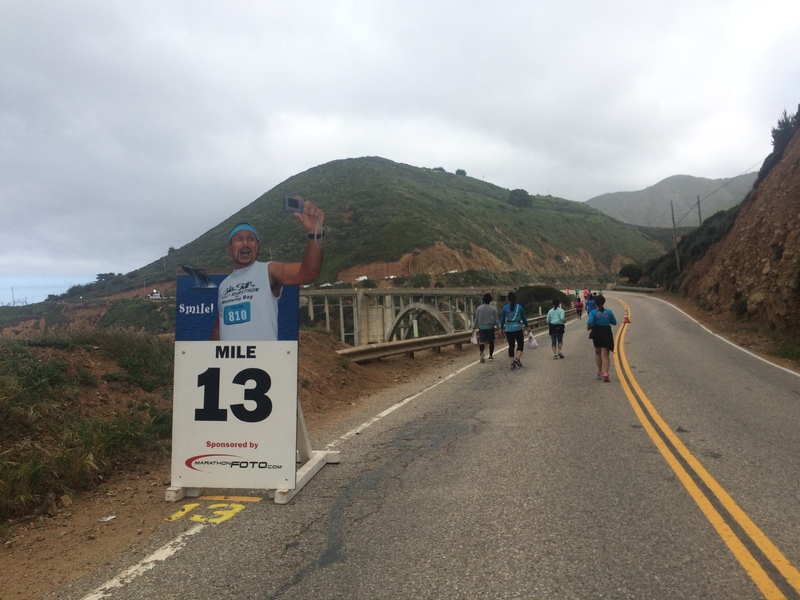 On Sunday, April 24, I crossed #1 off of my running bucket list: Big Sur Marathon. A bit of background on why it was such a big deal to run this race: after shattering my left tibia/fibula in 2007, I spent about 5 months on crutches recovering from ORIF surgery (2 plates, 17 screws & a rod). My surgeon told me I’d walk with a permanent limp, that I would have to quit roller derby & that running long distances probably would be too painful. So of course I immediately started looking up destination marathons (after I ordered new derby skates, naturally). Google Image Search brought up Bixby Bridge – I was in awe of its majesty & the beauty of the entire coastline. 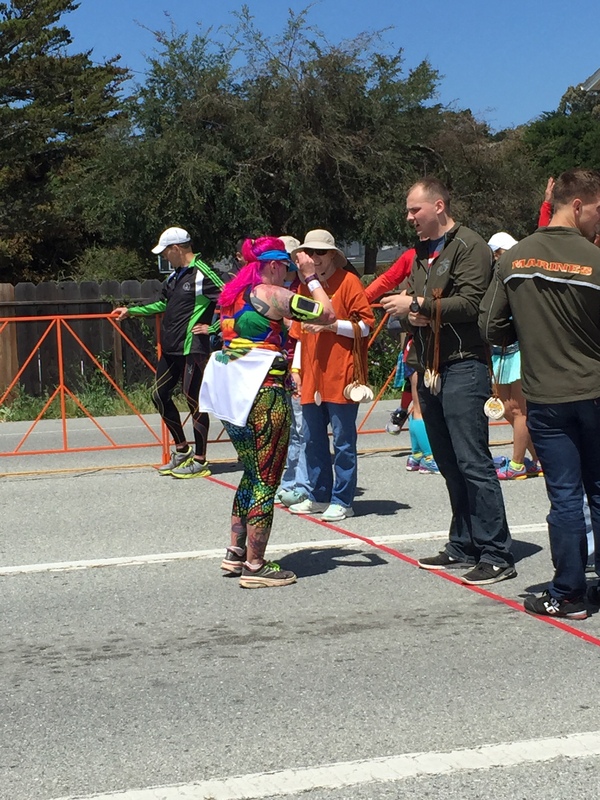 My Running Bucket List was created right then with Big Sur Marathon as my first entry. Fast forward through 6 more seasons of derby, 2 marathons, 25 half marathons & around 60 shorter races to 2015, when I entered the lottery for Big Sur. I told my awesome brother Kris what I was doing & he immediately put my sister-in-law/best friend/favorite running buddy Jenny on the list too, unbeknownst to her. In fact, Jenny had no idea she was running a 2nd marathon until I texted her to let her know that we’d both gotten in! Thank goodness she is incredibly cool about surprise race registrations. Training went smoothly and I got to the start line without any injuries (unlike my first marathon). Jenny, our friend Ted and I had all been stressing for awhile over the strict 6 hour time limit and the drive up and down the course the day before hadn’t exactly set our minds at ease. This was going to be the toughest course I’d ever run by a long shot. For the first 5 miles, we were physically (and mentally) sheltered from the coastal winds by redwoods. We were ahead of our goal pace (Ted was even farther ahead, disappearing into the distance with the 5:30 group while I had Jenny and me on target for a 5:45 finish). We were appreciative of the cool weather and the peaceful beauty of the woods. We’d read that the first 5 downhill miles are deceptively easy, but knowing that didn’t prepare us for the force with which the 30-40mph winds hit us when the trees gave way to coastline. By the time we hit the 10K mark, it had started drizzling lightly and the headwind was already brutal. We were in danger of dropping below cutoff pace if this wind kept knocking us back. Jenny and I had made a pact that if one of us was hitting the pace faster than the other then we would part ways. 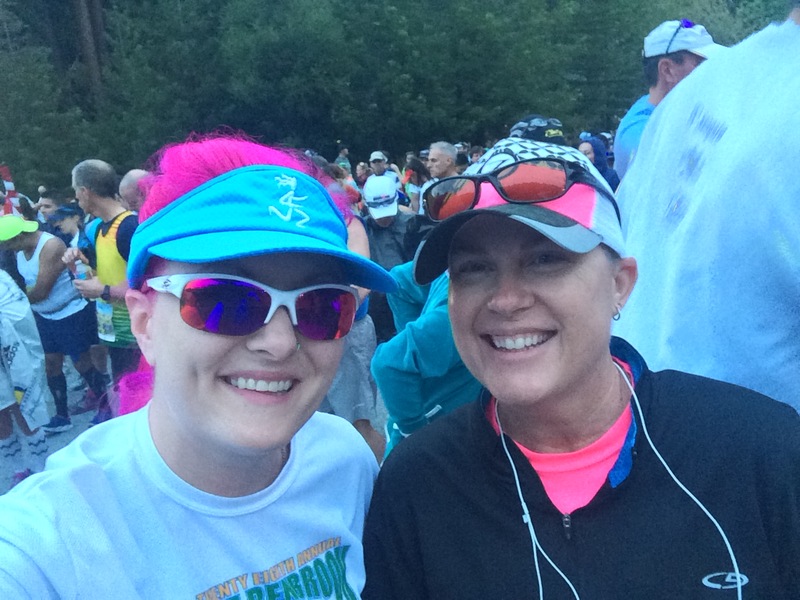 I hated to take off without my favorite running buddy but I was still trucking along despite the headwind, so she urged me to run my race and she’d see me at the finish line. I ran into Ted around mile 7 on a rough uphill and we spent a few minutes together before I pushed ahead. I was on a mission to beat the clock (and the 6 hour cutoff pacer that was now far enough behind me to relax a bit). The sound of the taiko drummers at the bottom of the 2 mile, 45 degree climb up Hurricane Point made my heart beat faster as I approached. Miles 11-13 are the most grueling of the course with a few false summits and morale-crushing views of what’s to come before the top of the mountain. 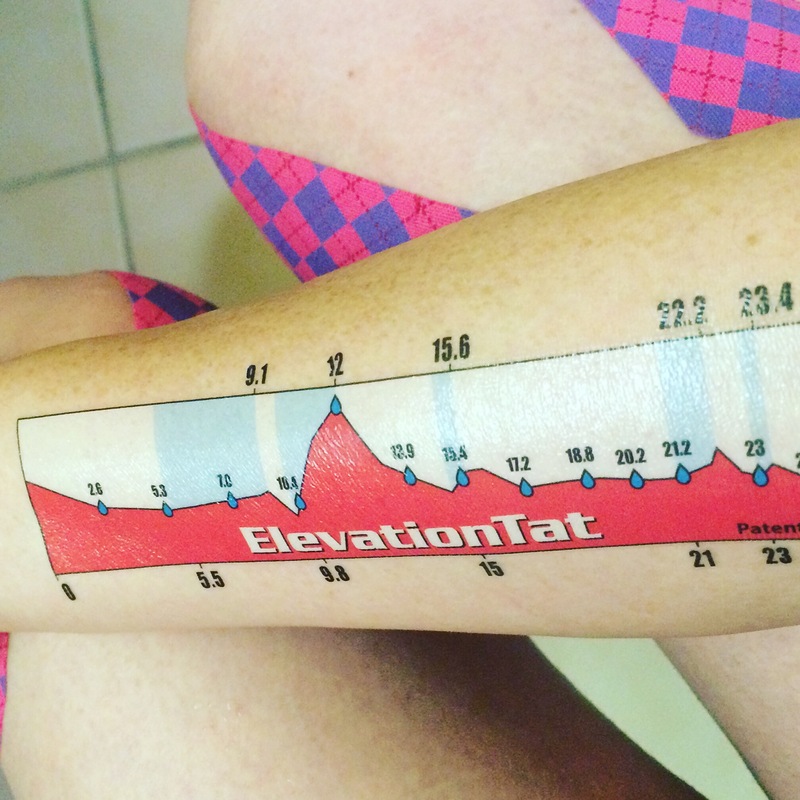 I was so happy to have applied my ElevationTat to help me track my progress and anticipate water stations – it came in handy so many times during the back half of the course, too. I kind of want this tattooed on me for real. I kept my head down and pushed onward and upward. At the very top of the mountain, just as the Mile 13 marker came into view, an extra-hard gust blew across a few other runners and me – it was like nature was trying to knock us down one last time before the descent to Bixby Bridge. I later heard that the gusts were up to 49mph and I absolutely believe it, as we were staggering sideways and seriously discussing holding hands to keep from getting blown off the cliff into the ocean. The descent to Bixby Bridge was as emotionally charged as I expected it to be, and when I heard the first strains of Michael Martinez on the famous grand piano I burst into tears. Crossing that gorgeous bridge represented so much for me – the realization of a dream I’d held onto for so long, the accomplishment I’d worked so hard to get to. I thanked God, wiped away my tears for the photographer and then prepared myself for the second half of the course. The back half of Big Sur features 13 rolling hills over 13 miles. They’re nowhere near as steep as Hurricane Point, but they’re bigger than this flatlander is used to and the roads are steeply banked, resulting in a dramatically uneven camber that might be more of a challenge than the actual hills. 15-19 are lonely miles, since there’s not much out there besides ocean and mountains – I saw more cows than humans, which is cool because that pretty much sums up my childhood on the farm anyway, minus all the water. I cannot tell you how happy I was to hit the 22 mile marker with 15 minutes to spare on the cutoff time – this is a sweep point with a clock and a large sign that lets you know you’ll be riding the bus back to the finish if you’re not there by 11:50am. At this point, I texted my husband (finally had reception after 20 miles) to tell him “I think I’m really going to finish this race!” There may have been more swearing involved, but you get the point. I had read a lot about the famed strawberries around mile 24 at the top of Strawberry Hill – people went on and on about these strawberries and how they were the best anyone has ever tasted. Naturally, I was looking forward to finally eating one of these berries. Naturally, they were all gone by the time I passed the empty tables. I told myself I’d eat all the berries I wanted after a couple more miles and pushed on. The last 2 miles were filled with spectators telling me how close I was to the finish. I couldn’t wipe the goofy grin off my face as I heard the announcer’s voice wafting out from the finisher village. I made the turn into the chute and I was finally, FINALLY there. The announcer said something sweet and funny about me being the most colorful runner on the course, but I barely heard her as I looked up and saw my friend Ted waving at me from the side. He got this picture of me getting my medal, which I deeply appreciate. My official time was 5:47:45, which was nearly 3 minutes slower than I’d hoped for but good enough to earn a medal. I finished this one without the crippling back pain and sciatica that caused me to limp like a wounded animal at Dallas Marathon. My knees even felt pretty good and I was relatively agile for somebody who’d just run for nearly 6 hours. I expected to be more sore but was incredibly thankful not to be (especially next morning when I had to sprint up/down stairs and through a terminal to avoid missing my flight due to a mobile boarding pass issue). I got a wonderful hug from my Sub-30 Club friend Shannon, picked up my post-race snack box (which was seriously nice, although there were no strawberries) and found Jenny, who had a horrible migraine from the wind. I hate that she felt so miserable for so long while waiting for me to finish, but I was so thankful that she was there. We got home the next day and the stages of marathon processing began. Then my husband made this shadowbox for me (to hang next to the one he made after Dallas Marathon) and I finally found a 6th stage of the process: Pride. Thanks for making it through this looooong read. Hopefully my next marathon report will be shorter, since I plan to be a little faster in general by then. 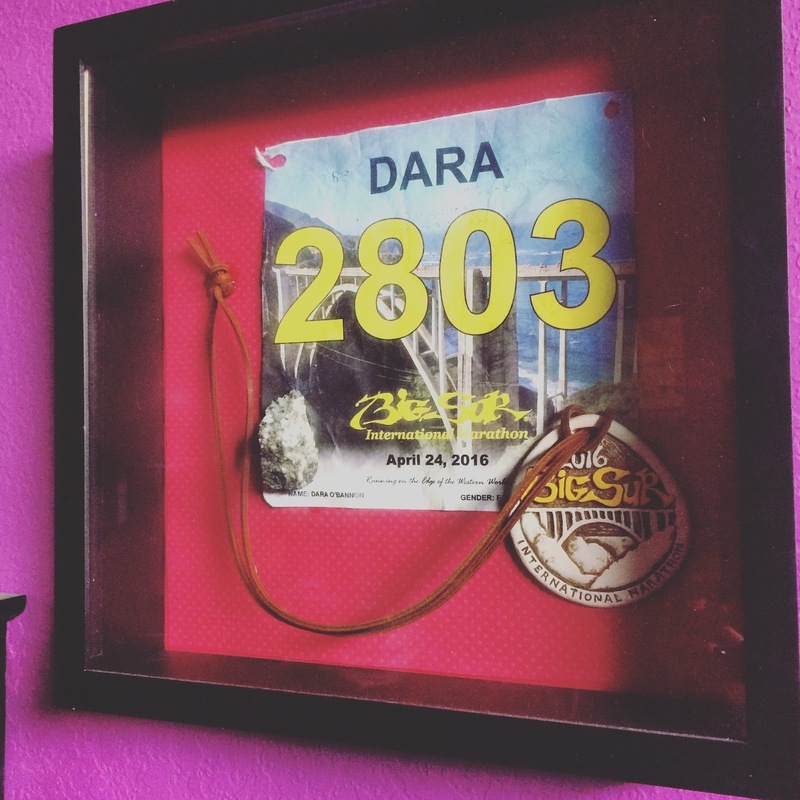 This entry was posted in Running, Uncategorized and tagged Big Sur, big sur marathon, hurricane point, marathon, marathon after tibia fracture, pynk fitness, pyro maim ya, running marathon after ORIF, slow marathoner, sub-30 club, sub30 on May 12, 2016 by Dara O'Bannon.